As with many of the activities I do with my English class, I stole the concept from Señor Martín. 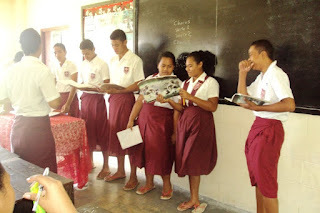 I teach English to my Samoan students the way he taught Spanish to his American students. It’s not exactly the same, but there’s some overlap. If nothing else, the singing tests brings closure to studying the lyrics and melody of a song, and it’s always fun to watch the kids squirm a little when they have to get up in front of the class to perform. The test essentially works as follows. After I’ve taught the lyrics and the melody and I’m satisfied with students’ comprehension of those things, I schedule a test. 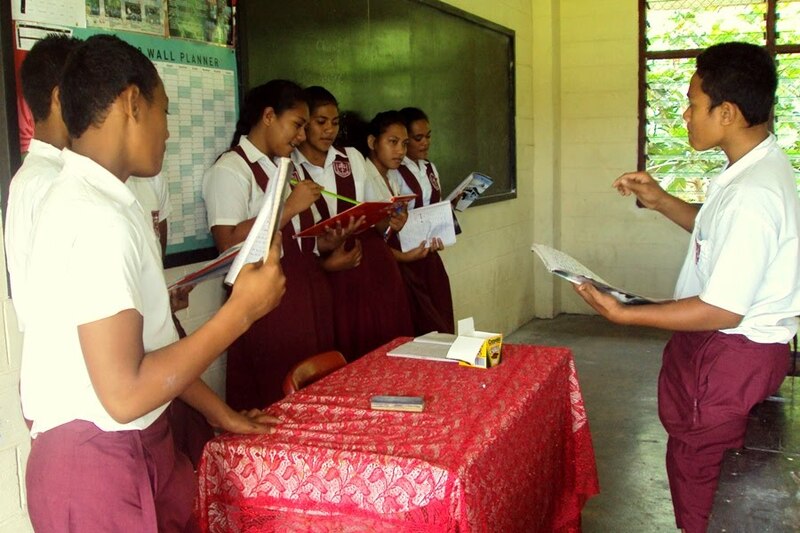 The test consists of groups of around 8 students getting up in front of the class and performing the song. No one gets graded for anything other than participation, but pride is a strong motivating factor, and most students are willing to put in some effort. When all the groups have gone, the panel of judges (i.e. me) announces the first, second, and third place winners. So far I haven’t given prizes, but I think I might try that sometime soon. When I first tried this with the class, figuring out groups was difficult. As with most social situations in Samoa, students sit clumped into boys and girls, as though there’s an invisible border. I prefer each group has a similar gender make-up, and I found that having an entire row of students group together was the best way to do this since rows run perpendicular to The Gender Divide. At the beginning I told the students they had to memorize the lyrics, but this resulted in uneven performances where entire groups would go silent or fade into gibberish for long stretches of melody. So I changed my mind and started allowing students to hold lyric sheets. Staying away from the lyrics sheet earns points with the judges though. Judging tends to be extremely arbitrary and subjective, I’m not ashamed to say. In fact, the more I ham up the judging the more fun the kids have. There’s a reason Simon Cowell was so captivating on American Idol: people like a reaction. When I announce the results, there’s usually a big crowd reaction, hooting and hollering. We’ve done this four times now, and the kids are familiar with the routine at this point, and have begun to up the ante a bit. During today’s singing test for Cat Stevens’ “Moonshadow,” several groups used percussionists, and two used conductors to keep the group together. The last group that got up to perform did rather dramatic curtain call. The judges gave them points for style. With the singing test comes task of finding a new song to teach. So far we’ve done Peter, Paul, and Mary; Herman’s Hermits; The Beatles; and Cat Stevens. Apparently I’m trying to raise a new generation of hippies. I’m thinking Simon & Garfunkel next. “Mrs. Robinson”? It might be difficult to explain the cultural context of “Where have you gone Joe DiMaggio,” but the kids would have a ball with the “Woo woo woo” part. I’ll think about it. Sometimes the gender homogeneity doesn't work out. Today we had an entire row of boys. They did all right. This group, the curtain callers, tied for first place with the group in the above-the-fold photo. 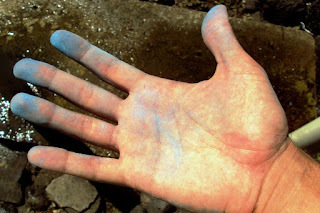 This was my chalky hand after my science class today. There's got to be a better way to say that. Although Mrs. Robinson is a good choice, how about the Beach Boys' Kokomo? I remember singing that in elementary school. i looooved it.